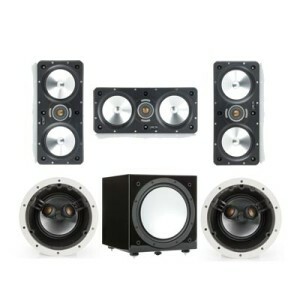 The ‘Trimless’ 200 two-way speakers marry C-CAM® bass drivers with a C-CAM gold dome tweeter. Optimum imaging and set-up are established via a pivoting tweeter, high frequency (+3dB / 0dB / -3dB) level adjustment, and Boundary Compensation (on / off) controls. The ‘Trimless’ 200 Series three-way loudspeakers feature our unique Inverted Dual Concentric (IDC®) driver module. The IDC driver module houses a 4-inch C-CAM midrange and 1-inch C-CAM gold dome tweeter. Optimum imaging and set-up are established via the pivoting IDC, high frequency (+3dB / 0dB / -3dB) level adjustment, and Boundary Compensation (on / off) controls.